So I have been withdrawing excess cash from my account since its peak value in Jan 2017. I still invest in loans that meet my criteria, but I have always thought it would interesting to see how much money would be in the account once I withdrew all of my principal. I know I know, it is the gain in the account, but never knew what that gain would be when the time came. Based on my current rate of withdrawal, I am about 1.5 months from withdrawing all of my principal. Currently I still have $33,154.71 to withdraw, then I will have no "skin" left in the game and it is all profit. Today that profit would equal $180,165.99. I will continue to invest in loans that meet my criteria, but I doubt I will ever add funds to my account again as LC shows no signs of returning to "hay days" / 10% returns I used to make. I currently make 5% and for the risk involved with these loans that is not sufficient and will continue to move to other investments. Saying that, my guess is (based on other accounts I oversee), my account will settle in around $125k and at that point the monthly payments generated will be sufficient to fund purchases of loans that meet my criteria. Overall, I have been happy with my investment at LC, but now it is more work that it is worth. I don't have proof of this as I have not done the analysis, but my guess is simply buying the S&P ETF with the funds I deposited into my LC account over the last 9 years would have been a lot more lucrative. - I have always been conservative, meaning more than 50% in A and B loans. During most profitable time, over 80% was A and B. Moved away from A's as interest rates fell. - Actively sell non performing loans. A year or two ago, I did an in depth analysis on all the loans I had sold trying to figure out if I did the right thing. At that point, I had saved myself right at $5k. 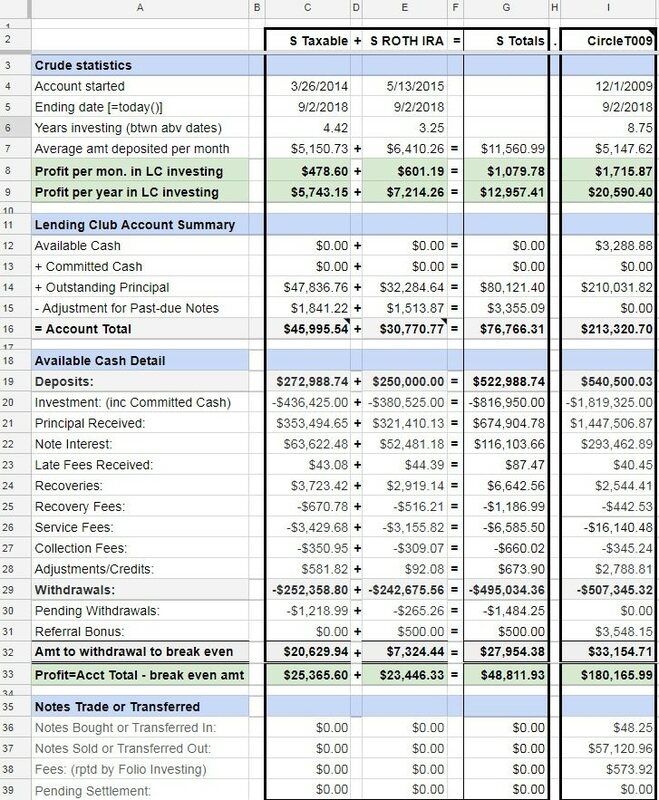 Meaning that if I never sold a single loan, I would have had an additional $5k in losses compared to what I did lose selling non performing loans. Enjoy. Interested to hear other comments/thoughts. Re: Thought this was interesting. Thanks for the interesting post. Well done! I'd guess in the top 1% performance of all accounts over that period. You have a super interesting account. Re: Dec 2009 -- Well done if you were trying to do some investments that did not correlate to the stock market and be better than bonds or something similar. Really appreciate you sharing your account details in the past few years as it motivated me to get more involved (read add more money). You also motivated me to look at that details page a little more and since I've shared my numbers in various forms in the past year I might as well share some of the details. You can see how a later bloomer into this compares to you as well. Doing it again, I think I would only do ROTH IRA since the taxes are such an impact to this type of investment. My profit for my taxable account below is obviously pre-tax. Now I'm moving money to Wunder Capital/WC (buying "notes" and getting payments thanks to LC setting up the regulations). Here is one of several excellent presentations on WC. In a Q&A at 43:25 minutes in they talk about Lending Club pairing "payment dependent note". https://www.youtube.com/watch?v=UFhaOiWlIXY FYI, I watch these on my PC internet web browser on youtube so I can use the gear icon in the lower right to set the speed to x1.25. I think the below is pretty close as it matched the numbers you quoted: $33,154.71 to withdraw & profit $180,165.99. Using some rough numbers (ie. 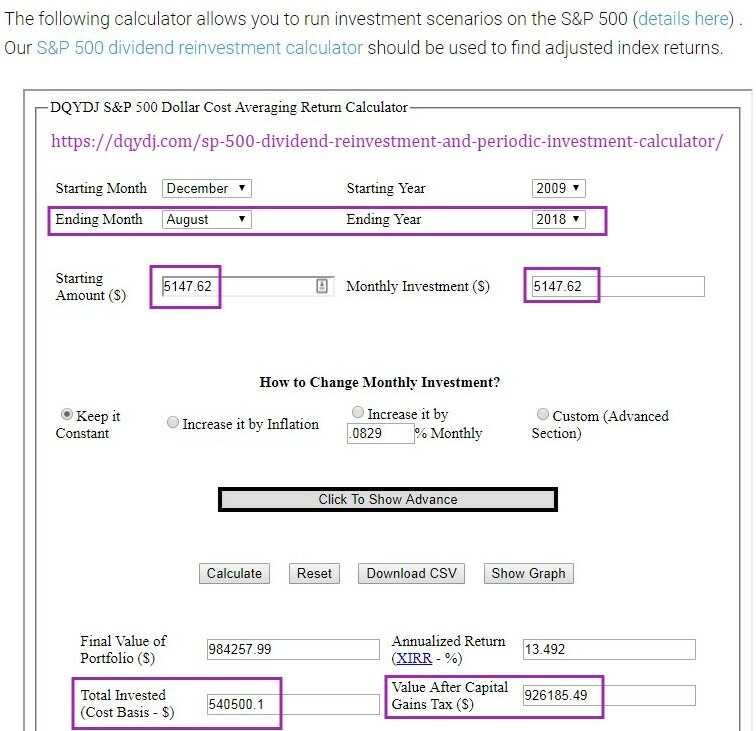 average deposits per month) here is a site I found related to the S&P 500. Starting in Dec 2009 to now was a pretty big bull run!! I think you could play with the numbers to only do deposit thru June 2016. Thanks for the kind comments guys. I did set out to find a non market correlated investment. Unfortunately, I was looking for that non market correlated investment right as we were starting to save money and the market had just gone through the recession and there was no way I was going to put our savings into the market. Turns out that is exactly what I should have done. Oh well. Lesson learned. If returns would have held up to what they were (meaning net 8-10%) and they did not continue to lower interest rates, I think things would be totally different. But LC went down a different road.